Home>Music> G Herbo Says Juice WRLD Is "The New Michael Jackson"
One of the this year's breakout stars has to be Juice WRLD. He's almost a shoe-in for the 2019 XXL Freshman list and with the success of "Lucid Dreams," he's quickly been put on everybody's radar. The young Chicago artist blew up seemingly overnight as his album Goodbye & Good Riddance continues to do numbers on a weekly basis. His plans for the direct future are currently unclear but he has been previewing an array of new tracks through his social media pages. One of his fellow Chicago rappers has insanely high expectations for Juice, comparing him to one of the all-time greats and thinking that he will one day reach "King of Pop" level. G Herbo logged onto Instagram and let his opinion be known that he believes Juice WRLD will one day go down in history as one of the greats. 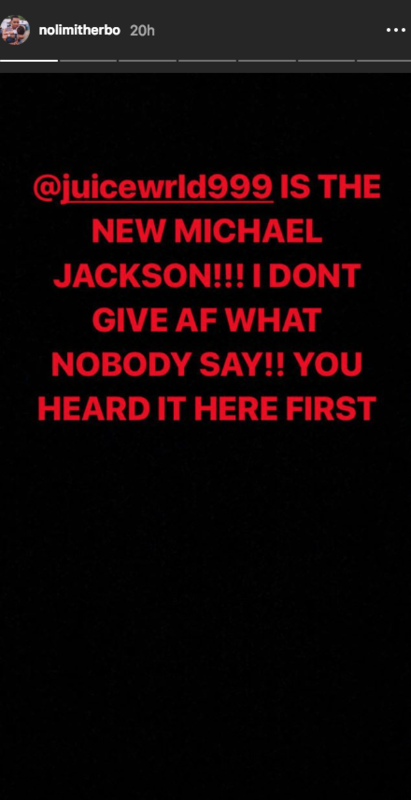 He tagged the artist, writing, "@juicewrld999 IS THE NEW MICHAEL JACKSON!!! I DONT GIVE AF WHAT NOBODY SAY!! YOU HEARD IT HERE FIRST." Sure Juice has a solid debut album to his name and a single that's gone absolutely crazy but Michael Jackson was a once-in-a-lifetime talent. This is no knock on the Chicago artist either as he has incredibly high potential, but reaching MJ levels will be a tough challenge. Hopefully, the "All Girls Are The Same" artist can live up to Herb's estimation. There's no doubt that Juice WRLD has a high ceiling but do you think Herbo is off base when he says he's the next Michael Jackson? MUSIC G Herbo Says Juice WRLD Is "The New Michael Jackson"